Recently I switched my wife over to Cricket Wireless. She was $45 5GB Unlimited Monthly Plan with another wireless carrier. However, she wasn’t using anywhere near that amount of data. She wanted me to find a less expensive monthly plan. Before looking for a replacement I figured out she needs about 900 minutes per month of talk time. She also needed to be able to send and receive MMS picture messages and use group texts. Finally, for data she needed to have enough data to use iMessage, Maps & Navigation, email, and the web when Wi-Fi isn’t available. I figured 1 GB of data per month should be enough as long as their was the ability to add data when needed. All these features needed to work with her BYOP iPhone SE. Since the reason to switch was to save some money I set a max price of $30 per month but I was hoping to find something in the $20-$25 range. Now she didn’t have a network preference, but she was satisfied with the coverage on the AT&T network. In the past, she was on a by the minute plan with T-Mobile and she was not happy with the coverage. Even though T-Mobile has improved the network coverage here, I was not going to suggest any service using the T-Mobile network. I decided to switch her to Cricket Wireless’s $30 Plan with unlimited talk and text plus 1 GB of high speed data. 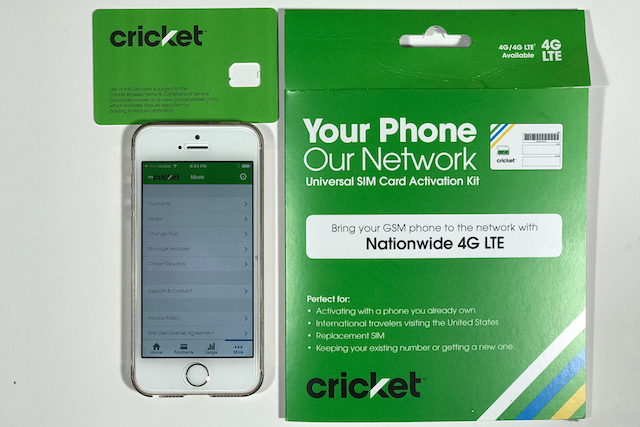 Cricket is owned by AT&T so the service uses the AT&T LTE network. Cricket has some very competitively price plans with more data too. The one catch is cricket has an max download speed of 8Mbps for their high speed data. You can also by extra data for 1 GB per month. I bought the $10 SIM Kit and a $40 Refill card. I signed up online and transferred her phone number. I signed up up by 11PM on a weekday and the transfer was ready by 11 am the next day. I waited until that evening to complete it. I had to call Cricket support once because I received an email stating their was a problem with the number transfer. When I called there turned out to be no problem and they told me the transfer was scheduled for 11AM. The Customer Service Rep from polite and effective, if didn’t ask but I’d guess she was in the Philippines. There wad a lot of background noise from other reps talking which made it a little hard to hear. I tried the voice, text, and MMS. It all worked automatically. I did not need to set the APN in the iPhone settings nor install an APN profile to get anything to work. Which was nice. Turns out the Cricket uses Visual Voicemail, which is nice, as her previous service only had regular voicemail. Cricket also has a nice account app, which I installed. You can manage your account, pay your bill, track your data usage, and buy more data from the app. Now most people want to know about that max 8 Mbps limit. Yes it’s real. She says she doesn’t notice any difference in the data speeds even with the restriction. According to Netflix, 5Mbps is fast enough for 1080P HD video. YouTube states it will work with less. I was able to play a YouTube video and watched a couple minutes of the Walking Dead on Netflix and it worked. I didn’t spend a lot of time watching video as it isn’t something does. I found the speeds for browsing the web and using Maps was fine. She says she doesn’t notice a difference. If you watched my speed test videos you’ll see the speed is really set at a max of 8 mbps down, but the surprise was that the upload speeds were faster than 8 Mbps. Cricket doesn’t support Wi-Fi calling, or at least I wasn’t able to figure it out how to turn it on. So, what’s the verdict? I like it. The 8 Mbps max download speed wasn’t an issue for us. We are able to send and receive MMS picture messages. Cricket works well with the iPhone and even supports Visual Voicemail. For Android phone users, I might look at some of the other prepaid wireles services that use the AT&T network, offer more high speed data, and offer speeds higher than 8 Mbps.